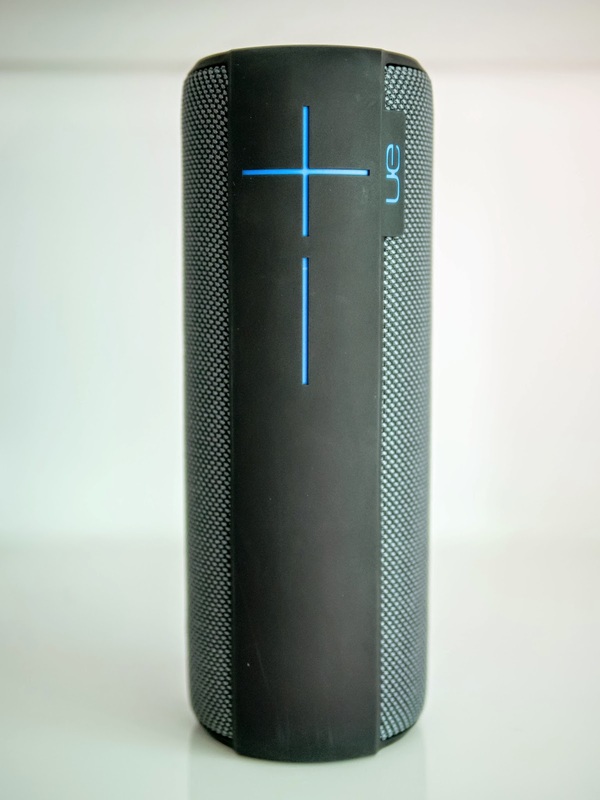 Oluv's Gadgets: Review: UE Megaboom - too much boom to be good? Happy new year with hopefully many new happy speakers! Therefore let's immediately start with the first one, the new UE Megaboom that was just released recently. 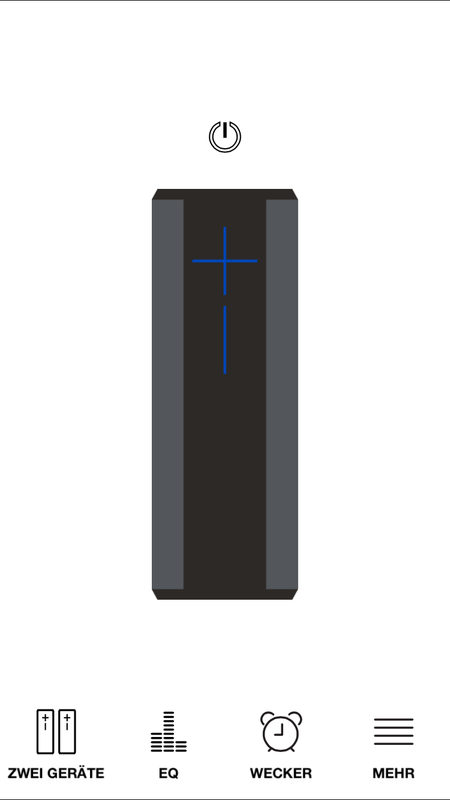 The Megaboom should hopefully improve on many aspects of the smaller UE Boom promising bigger sound, bigger bass and better features out of a bigger body. I was never a big friend of the original UE Boom. Although it had some great potential, it failed completely on overall sound quality and I also found it to be overpriced too much for what it offered. Now the Megaboom seems to continue with this fashion to be priced higher than the competition and equal to many other comparable portable "permium" speakers thus at 300$/€ it competes directly with current offerings like those from Beats with their Pill XL, or the Infinity One and the Bose Soundlink III maybe even the slightly more expensive B&O Beoplay A2 which has a similar 360° sound concept. Come in to see if Ultimate Ears can really keep the promise of offering something outstanding this time. The original UE Boom got raving reviews all over, despite being just an average clockradio sounding speaker, albeit a loud one. I am not quite sure why so many still like it but the first reviews of the Megaboom seem to repeat the same story again because the Megaboom is equally praised by all the excited reviewers, although I hardly found any meaningful details regarding sound, they simply state it to be better than the UE Boom, which in reality is not that hard to achieve as meanwhile some speakers costing less than half easily manage to outperform the UE Boom. Of course I got curious and grabbed a Megaboom to have a listen on my own because I am always in search of something better and would be willing to replace some of my current portable speakers. I am not bond to any brand despite being really satisfied with the Envaya Mini as close to pocket-friendly solution or the Infinity One as more of a backpack solution. 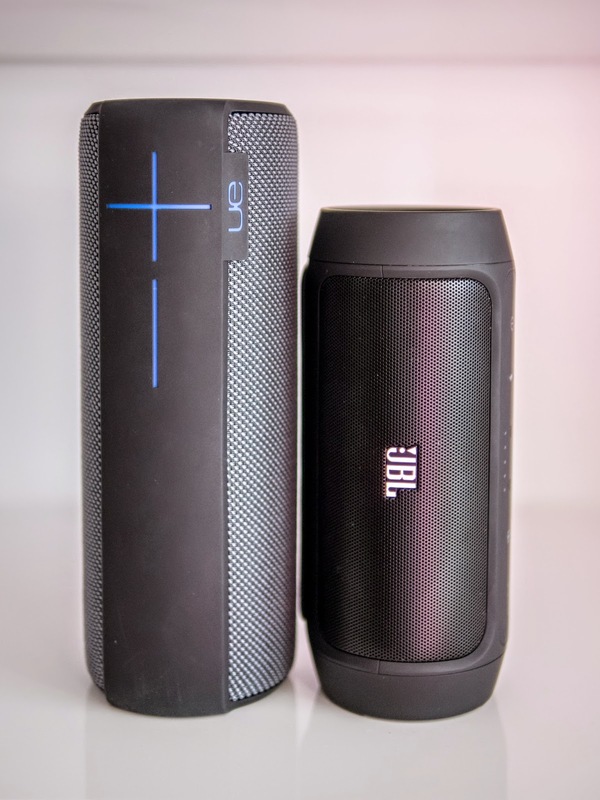 Indeed the closest competitor to the UE Boom might be the Infinity One, it has exactly the same length, but is slightly thicker and also quite a bit heavier at 1.3kg with the Megaboom weighing only 0.9kg. The low weight is in fact surprising because most comparable models are heavier with 1.5kg or even more, with only the B&O Beoplay A2 being lighter but still 200g heavier than the Megaboom. The Megaboom is truly quite portable not only because the size is still quite acceptable, it doesn't really feel that much bigger than the JBL Charge 2, but also because it feels less sensitive to damage than the Infinity One, which might give a premium impression at first due to its uncommon stone-like ceramic coating, but in reality is quite prone to scuffing when stroked by some other hard objects, let alone the exposed passive radiators on both Infinity One and JBL Charge 2. 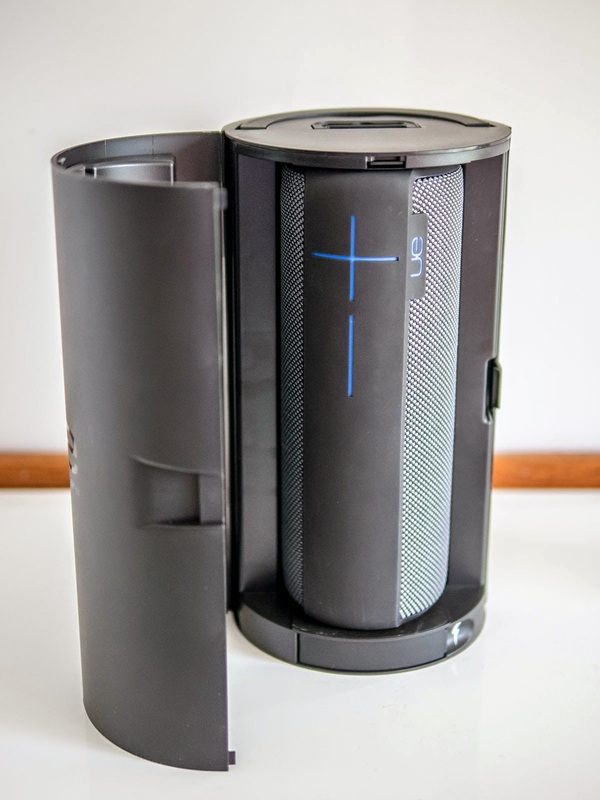 Just like the previous one the Megaboom comes packed inside a round cylinder box, but this time the box is really big, hinting at a much bigger speaker than it actually is. Thanks to its top handle the box could even be used as some protection for transport, but because of the huge size this would really take up all space in any backpack, which is a pity and wasted potential if you ask me, otherwise I am asking myself why I would like to keep that box, it is fancy for sure, but doesn't quite make sense. Inside the box you will find a charger and a flat MicroUSB wire in addition to the speaker, but no manual at all. Designwise the UE Megaboom looks exactly like the smaller Boom, it is just bigger. In contrast to the old UE Boom which was only splash water resistant, the Megaboom is now completely water proof and can be submerged into water for half an hour at a depth of 1m. There are no IPX ratings given for the Infinity One, but according to the support it should also be completely water proof not just splash resistant. The Megaboom got a stronger battery which promises 20 hours of playback and it supports NFC pairing now, but there is still no AptX onboard. 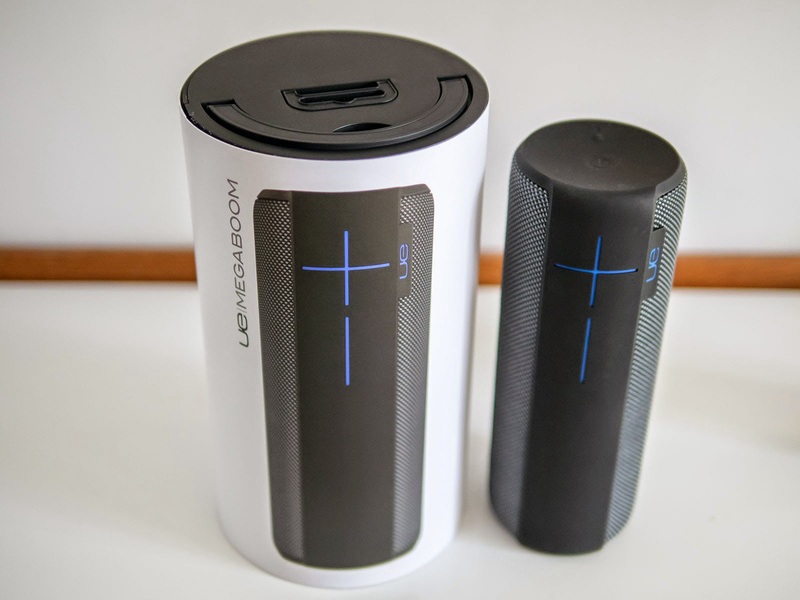 Thanks to multipoint pairing it can stream from 2 devices simultaneously (of course stopping the previous playback if a new one is being started) and it can wirelessly connect to another Megaboom or even a Boom to act as a stereo system or to double the output. There is an app for iOS and Android devices which takes care of the additional features and also adds a built in Equalizer with some fixed presets and a user customizable 5-band EQ setting. A really nice addition is "smart bluetooth". This gives you the option of powering the speaker on or off remotely directly from within the app. First I thought it to be just a gimmick but it was really helpful to turn the speaker on while being in another room. This worked pretty well because Bluetooth reach of the Megaboom is indeed impressive. I had no dropouts within the entire house and sometimes the Megaboom even connected to devices in the first floor while standing in the cellar where I had left it playing for my battery life test. I got exactly 3:25 at maximum volume. 1 minute before turning off on its own a voice reminded me to attach it for charging. 3:25 is not really classleading, but still better than many other offerings like the 50 minutes I got from the B&O Beoplay A2. 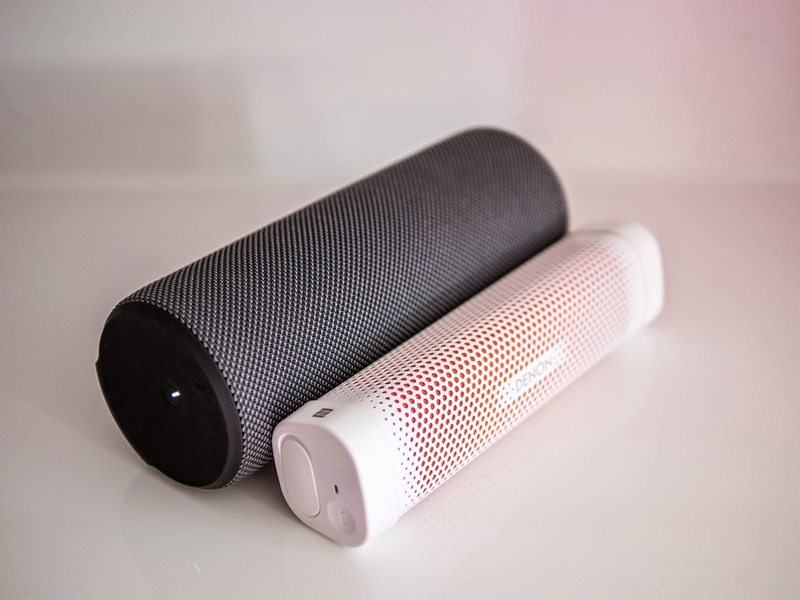 The Infinity One would play for 4:40 with exactly the same playlist while the Pill XL should give you more than twice the playback of the Megaboom, so if you intend to use it at the beach for an entire day, avoid turning the Megaboom to the maximum whole the time, otherwise you will drain the battery too quickly. 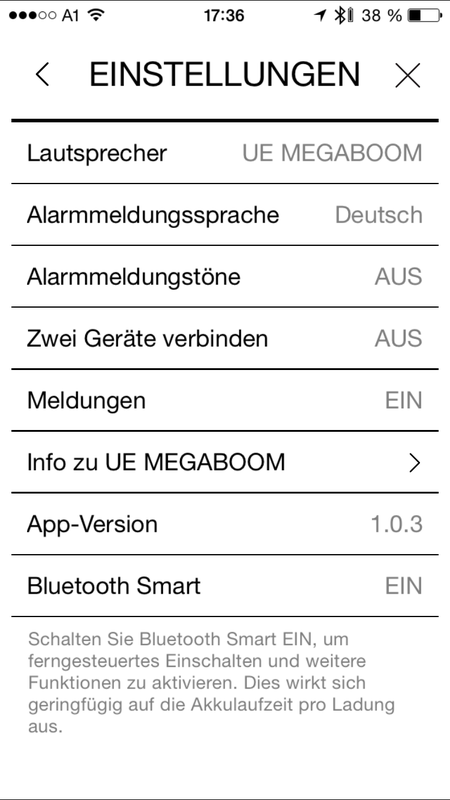 The UE Megaboom can also act as an alarm even when in off-state because the app will turn the speaker on automatically and start either some last played song or some songs you added from your library before. This worked indeed although I didn't really want to test it, but I forgot to turn the alarm off again after fooling around with the app and was quite surprised the next morning to hear the Megaboom actually playing from another room. User interface is pretty simple and minimalistic, Just a power button and pairing button at the top and 2 volume buttons at the side. There is no track control possible directly though the speaker. Volume is mirrored between speaker and iOS devices and thankfully the 32 available steps are fine enough to allow for a sensitive control in contrast to the 16 steps of a JBL Charge for example. Loudness increase is rather constant throughout the entire range so the speaker won't already reach half of its possible loudness within the first several steps like some other speakers (I am thinking again of the *ahem* JBL Charge 2 here). At the bottom there is a rubber flap that covers the auxiliary and charging port and protects them against water. I am not quite sure if the Megaboom would be waterproof without this flap, but the Fugoo for example had all ports water tight, so there was no need for any flap. Charging is accomplished with a standard micro-USB cable, this way it can be charged on the go as well from any possible USB-output. The port is a bit recessed and it might take a bit of effort to fit the plug in. The Megaboom does not have the ability to charge other devices though. When removing the bottom screw a thread is revealed which can make you mount the Megaboom on a tripod or similar. I am not quite sure why I would actually want to do this, but just for trying out, I did. After turning on the Megaboom will play some bongo-drums as welcome tone similar to the old Boom. These tones get varied depending on the status. When a bluetooth connection is established another bongo-sound will be played, when the speaker is turned off you will hear something else, but still bongos all the time. Thanks to the app you can deactivate these tones completely which is good, because they are quite loud. When connected to a Bluetooth device you can force pairing to another one, while the first one is still playing. When the second one has successfully paired you can switch playback between both back and forth. Once paired the UE Megaboom has quite an aggressive way to connect to already paired devices. Usually I was always complaining if a speaker refused to reconnect to a known device on its own, but in case of the Megaboom multipoint connection seems a bit messy. You never really know which devices are currently connected, if you have more paired devices like for example your computer, your smartphone, your tablet and the phone from your wife, you or the speaker might quickly get confused as I have not found any real way to decide which devices it should connect to unlike the Bose Soundlink Colour, which can cycle through all available devices. 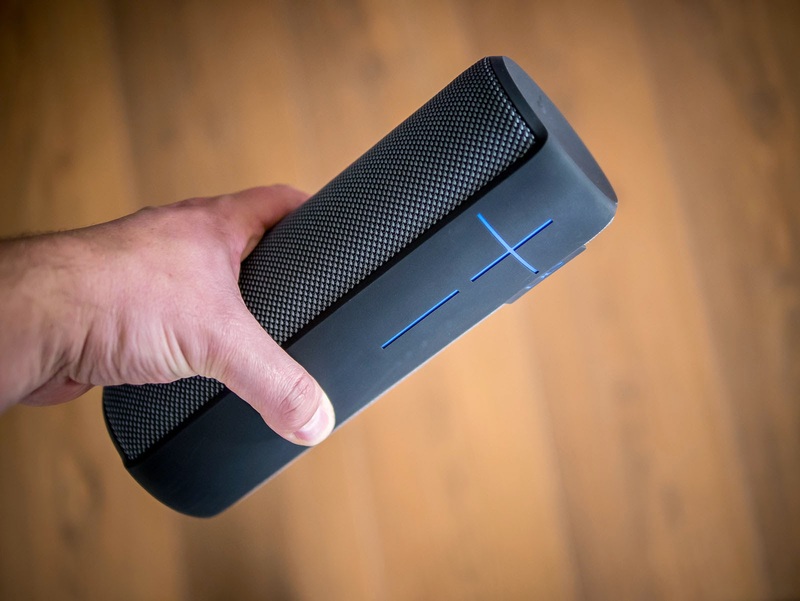 With 2 devices connected simultanously the Megaboom might start blasting tunes at maximum volume suddenly, despite your own device being set to low volume, but another one set to maximum. This happened to me several times when I just wanted to listen to some quiet tunes, but the Megaboom seemed to have connected to some other device as well and started playing them back at maximum instead. I am not quite sure what was going on here, but it was scaring. With 2 devices running the app the speaker might also mix up some settings. Although I had turned all bongo playing off through the app, the next time I turned the speaker on they started playing again. These might be trivia, and will hopefully get sorted out in the future with some upcoming firmware update. But how does it sound? I must confess it was quite hard to judge the sonic qualities of the UE Megaboom, because it doesn't sound completely bad, but it sounds odd enough to rather dismiss it for anyone being serious about listening to music. I think it is also the fact that you have to judge the entire volume range that makes an all-embracing sound evaluation harder, because when just playing it at room listening volume it makes the UE Megaboom look pretty sub par compared to many other offerings. It benefits quite a bit when played at higher levels, because the sound doesn't deteriorate that much and only becomes more forced at maximum level. The UE Megaboom can indeed play pretty loud, although I would avoid the last 20% of its volume-range, because bass is dialed back too much but sound is still pretty well under control with little distortion and only some slight limiting. It sounds most convincing at levels between 60-80% where many comparable speakers (including Infinity One, Bose Soundlink III etc) already suffer considerably adding heavy dynamic compression with stronger bass reduction at the same time while already fighting with some intermodulation distortion. 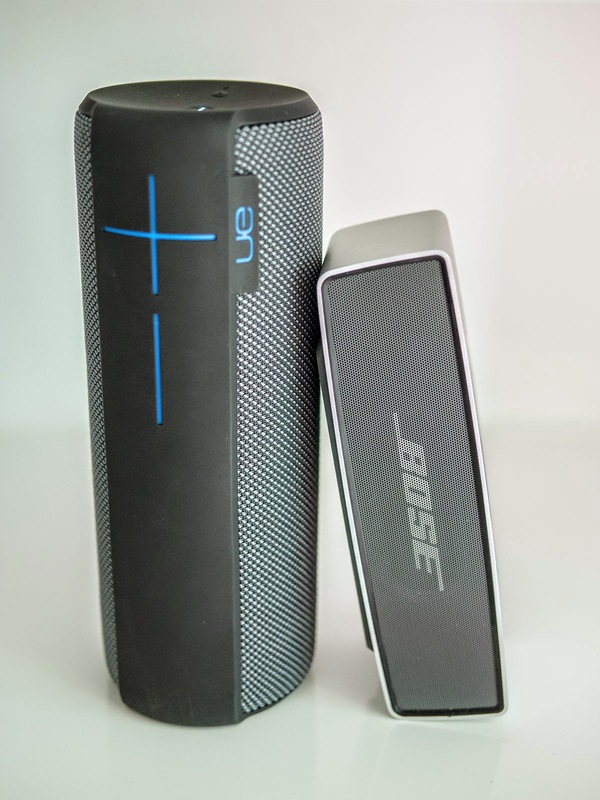 The UE Megaboom can play nearly as loud as the Beats Pill XL, but I would definitely choose the Pill XL over the Megaboom anytime, despite not being a big fan of the Beats sound tuning either, the Pill XL performs better overall and manages a more punchy sound at all levels including a higher overall loudness with stronger bass than the UE Megaboom. As a whole I would rather describe the sound of the Megaboom as strange and honky with no wow-factor but an unpleasant upper bass boost and an equally boosted lower treble instead that rolls off pretty quickly missing all the real upper sparkle. The sound is a bit unskillful because it doesn't impress in any way as meanwhile you can get a better and more natural response of speakers costing less than half and being smaller as well although they won't be able to play that loud for sure. The Megaboom pretends to deliver true 360° sound, but it suffers quite a lot if not one of the 2 drivers that fire to the sides are aimed directly at the listener. Maybe that's why they boosted the whole treble-range to make it appear less muffled if the speaker is placed frontally, but it cannot distract from the fact that the 360° sound claim is just a marketing blah, because depending on how you turn the speaker it either has the tendency to sound acceptable or dull. The fact that real tweeters are missing just cannot be hidden.You get the impression as if the speaker was playing to the back most of the time, or if the sound was trapped inside the cylinder and some other additional speaker was trying to compete against the enclosure. A JBL Charge 2 placed backwards doesn't really sound much worse than a UE Megaboom placed frontally, although the Charge 2 has only drivers at the front. This 360° myth was already suspicious on the old UE Boom, which equally suffered if not aimed at the listener sidewards. It is no way close to the 360° experience you get from the Beoplay A2 with its crystal clear treble, that hardly becomes dull at all. With the speaker turned around to hear both drivers at the same time you will end up with a veiled sound, but nevertheless hardly any real stereo separation. 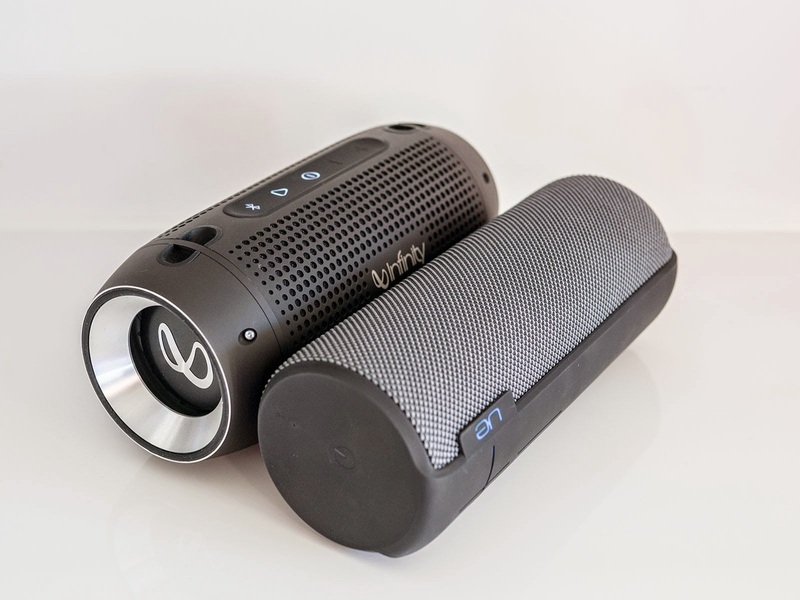 A Denon Envaya Mini on the other hand will offer a real spacious sound stage, the Beoplay A2 also manages a broader and more airy sound floating around the speaker, while with the UE Megaboom it seems to stick to the body. Apart from the lousy treble response which seems to rely solely on its fullrange drivers, bass is tuned quite unfortunate as well. 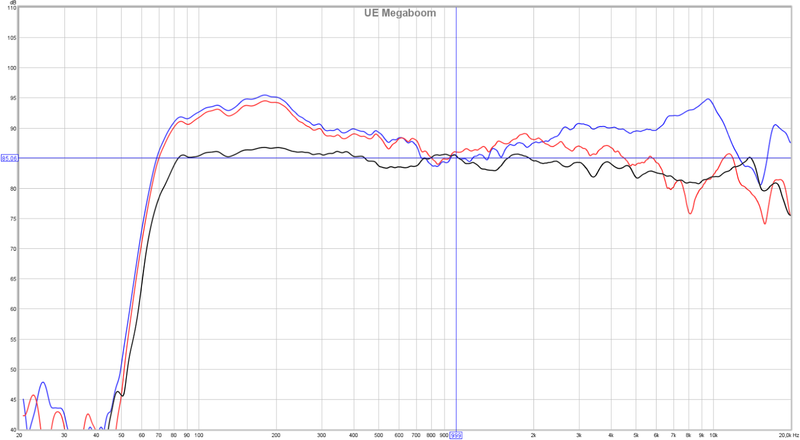 According to the specs the UE Megaboom should have bass response down to 65Hz, but this is only partially true, because bass already starts falling off above 100Hz. It is only that it is boosted as a whole quite a lot, so in the end you might indeed get 65Hz but hardly noticeable because of some -20dB difference compared to the upper bass range around 200Hz. I think bass is boosted that much, to make it reach deeper or to give you the impression as if it was deeper, which in reality it isn't because it is just bloated as a whole. I am sure the strong upper bass boost is to blame for the rather hollow sound, it already overlaps too much with the mids and it covers too much of the lower frequencies. 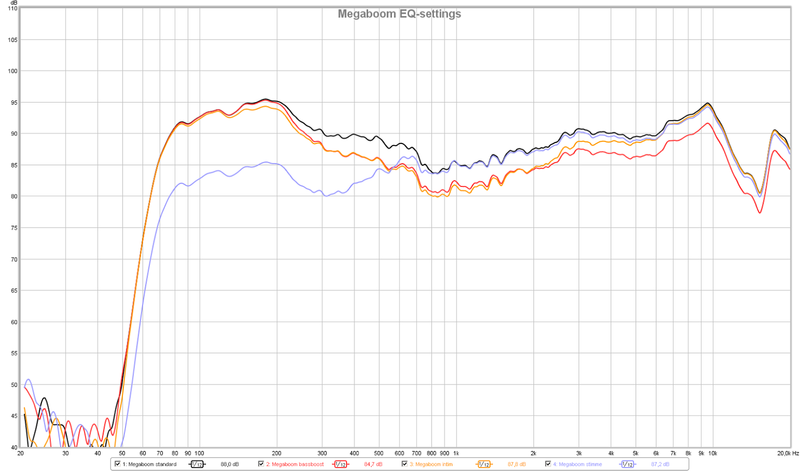 At 200Hz there is a 10dB boost compared to the mids. A range which is usually responsible for all the buzzing problems of a speaker and that preferrably should be tuned down instead of boosted. Not sure who tuned the speaker and what kind of music they were listening to when setting for the final tuning, but it just doesn't sound good as is. It sounds as if some kid had played with daddy's amplifier and turned up the bass dial to the maximum. 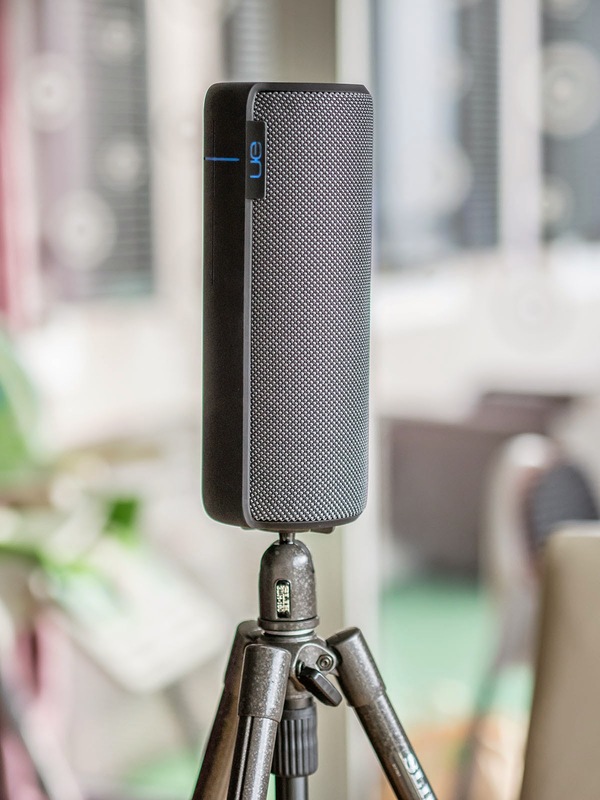 It is not completely hopeless and I am sure many might be anyhow excited about the "boom" the speaker is able to produce, but this is definitely not a speaker for music enthusiasts longing for higher fidelity, but rather for people looking for loud noise! Funnily tuned like that the Megaboom loses all of its loudness advantage and will hardly reach the loudness of the Infinity One anymore, at the same time it doesn't really sound much better than before, just more anemic. I also noticed some anomalies with the EQ which doesn't seem to be permanently stored within the speaker, but sometimes tends to fall back back to "standard setting" again, I noticed this problem repeatedly when just skipping to the next track, although the app still showed "user EQ", the playback was continued with the standard setting. Bottom line is that the great design and all the unique features cannot distract from the unjoyous sound the Megaboom produces. Buying 2 Megabooms for 600 bucks in order to get some stereo separation would be nutty if you ask me, but I am sure there will be many doing exactly this, just because its an "UE" and because it got all 5 stars on "What-HiFi?" It seems the Megaboom was in fact tuned for maximum loudness instead for maximum sound, which is a pity, as I ask myself how often will I really like to crank it up to the maximum all the time? It is the only thing it can do acceptably well: playing loud with little distortion. 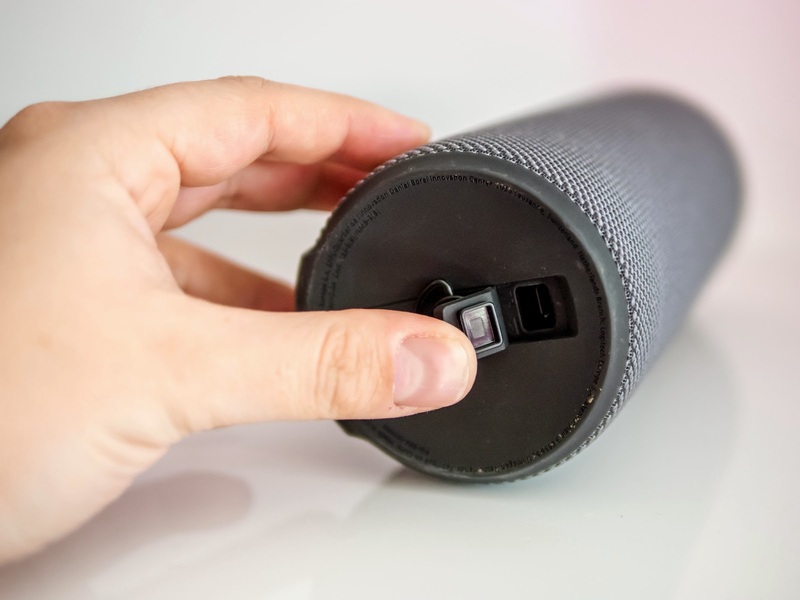 If this is what you are looking for, you should check out the UE Megaboom, but at the same time you could also just choose the Pill XL and end up with a better sound, although you will have slightly more bulk and more weight to carry. The Pill XL might not be water proof, but it can equally pair with another one for wireless stereo and it can charge external devices, but best of all the battery (in fact the Pill XL has 2 of them built in) is stronger because if you really need maximum volume, it will last about twice as long as that from the Megaboom, which won't even reach 4 hours at its top volume setting. 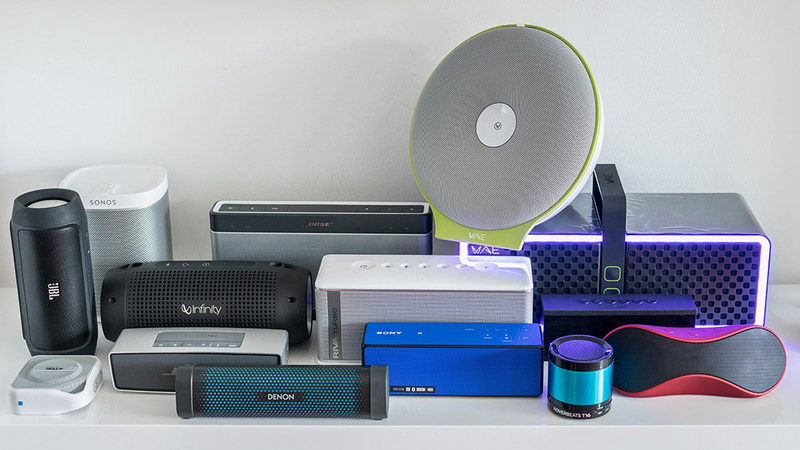 dürfte ich dich fragen, welchen oder welche Bluetooth Lautsprecher du als den oder die besten empfehlen würdest? Ich kenn mich leider nicht wirklich gut aus, aber wollte meinem Freund Bluetooth Lautsprecher schenken. Zuerst dachte ich an den A2 aber der soll bei maximaler Lautstärke nur 50 Minuten durchhalten. Ich weiß nicht wie lang er bei einer Lautstärke durchhält, die für eine Feier im Freien gedacht ist, aber so an die 7h sollte es bei uns schon halten. Deswegen dachte ich dann an den Beolit 15, sieht natürlich auch toll aus, aber auch recht teuer und ob sich das lohnt? Wir haben keine Stereoanlage zuhause, daher würde ich gerne gleich in was gutes investieren, was man aber eben auch im Haus mitbewegen kann und auch draußen, z.B. auf der Terrasse benutzen kan.
Dann dachte ich an den Megaboom, aber jetzt hat mich etwas dein Soundfazit abgeschreckt. Ich wäre dir über ein paar Tipps sehr dankbar, von den Genres her ist zwischen Rock, Pop, House, Akustik und ähnliches alles dabei. der Beolit 15 klingt schon sehr erwachsen, ist aber auch gross und schwer, hat aber auch das Problem dass er bei hohen Lautstärken nicht besonders lang spielen kann, er spielt aber auch eine Ecke lauter als der A2. Einen Versuch wert könnte auch der Teufel Boomster sein, der kann neben dem eingebauten Akku zusätzlich auch noch AA-Batterien aufnehmen, damit sollten mehrere Stunden möglich sein. Ich hab ihn selber leider noch nicht gehört, bin mir auch ziemlich sicher dass er nicht auf das Niveau vom Beolit 15 kommt, aber er ist auch fast nur halb so teuer. Wenn lange Autonomie wichtig ist, muss man sich eher die Outdoor-Modelle wie den Braven HD anschauen, die halten mehrere Stunden ohne Strom, aber auch da kann ich zum Klang nichts sagen. Wenn es jetzt nicht extrem laut sein soll, wäre auch der JBL Charge 2 eine gute Option, der klingt eigentlich in diesem Format am besten und hält auf Maximal auch fast 7 Stunden durch, ist aber nicht ganz so laut wie der A2 beispielsweise. Für eine gößere Gartenparty vielleicht zu wenig. Vielen Dank erst mal für deine Antwort! Okay also wirklich wirklich laut muss es nicht sein, ich kann das auch wirklich schwer einschätzen ob so ein JBL Charge 2 reicht. Reicht es denn mit 20 Leuten Outdoor? Richtig laut können wir ja schon wegen den Nachbarn nicht machen. Den Riva bekommt man glaub ich nur in US oder? Was sagst du zur Bose Soundlink 3? Besser als Megaboom? Besser als JBL Charge 2? Sonst noch eine alternative? Die anderen müsste ich dann schauen wegen Klang. Kannst du mir zufällig sagen wie lange dann ein A2 halten würde wenn man mit 15 Leuten draußen feiern möchte und schön Musik im Hintergrund haben möchte? Weil ich weiß nur das es bei max. Volumen 50min halten soll. Ist wirklich nicht leicht zu beantworten. Der JBL würde auf jeden Fall für eine größere Runde reichen, aber er spielt dann schon am Limit und ein Fussballfeld beschallt er sicherlich nicht. Aber der JBL klingt von den kleineren auch auf Maximal noch recht voll, wobei die Dynamik etwas flöten geht, aber auf jeden Fall besser als Soundlink Mini usw. Soundlink 3 ist so eine Sache, der Bose klingt auf jeden Fall leise deutlich voller vielleicht sogar zu basslastig, aber bei hohen Lautstärken würde ich Megaboom sogar vorne sehen, die spielt ganz OK, wenn man wirklich laut aufdrehen will. Beim A2 ist toll, dass er rundum gut klingt, Megaboom klingt zu dumpf trotz 360° Abstrahlung, A2 klingt auch viel reifer, dagegen klingt Megaboom wie ein Spielzeug, aber auch da wieder, bei hohen Lautstärken relativiert sich das alles und es kann sogar sein, dass Megaboom die bessere Leistung abliefert. Ich denke nur, die meisten werden die nie so laut aufdrehen, einfach so für zuhause etc fand ich den Klang nicht berauschend, da sind all die anderen deutlich besser. A2 hat bei mir im gemischten Betrieb, also mal leise, dann etwas lauter und auch mal kurz Maximal nicht mal 4 Stunden gehalten, danach wurde die Lautstärke auf die Hälfte reduziert, was nicht besonders laut ist. Okay ich seh schon nicht einfach. Meistens hören wir ja eh nur zu 2. zu Hause Musik im Hintergrund ich denke da werden alle von der Lautstärke reichen. Nur der A2 ist natürlich schade, 4 Stunden ist einfach zu wenig wenn ich z.B. einen Nachmittag auf der Terrasse liegen möchte und etwas Musik haben möchte. Wenn ich das richtig höre ist der Megaboom dann nur was wenn wir wirklich regelmäßig laut hören würden, was wir nicht machen bei den 5 Partys im Jahr die wir machen. Für den täglichen Gebrauch zu Hause ist dann wohl die Soundlink 3 oder JBS die bessere Wahl? Halten die Akkus da auch mal 6h aus? Oder der Beolite als teuere Variante. Wie lange könnte man damit eine Gartenparty machen? Was hält der Akku da aus? Nein, der A2 wäre für gemäßigte Lautstärken sicherlich besser als all die anderen. Er hält auch auf halber Lautstärke etwa 15 Stunden durch bei meinen Tests. Sehr schnell geht der Akku in die Knie, wenn man lauter macht, also so bei 3/4 oder darüber ist sehr bald Schluss. Wie die überhaupt auf 24 Stunden kommen wollen (Herstellerangabe) bleibt mir ein Rätsel. Der Beolit 15 ist vom Akku etwa gleich bemessen wie der A2. Auf Maximal kaum eine Stunde, dann wird reduziert, aber er spielt auch eine Ecke lauter als der A2. Der Beolit klingt sehr erwachsen und macht wohl auch am meisten Spaß von all jenen. Megaboom würde ich allein dadurch nicht erwägen, weil sie einfach nach einer hohlen Röhre klingt, nicht nach einem echten Lautsprecher. Okay also meinst du der A2 wäre dann für unseren täglichen gebrauch mit dem Beolite (je nachdem wo ich dann das Limit setze) die beste Variante? kann ich den denn notfalls auch an die Steckdose anstecken? und dabei Musik abspielen für den Fall das man doch mal Lauter Musik hören will und der Akku leer ist? Halbe Lautstärke müsste ich mir mal anhören wie laut das ist. Sollte aber normal reichen für ein Abendessen mit Freunden oder? Also für den Alltag ist der A2 am besten, er klingt einfach wie ein "großer" Lautsprecher und ist sehr angenehm abgestimmt und kann in gewisser Weise auch beeindrucken. Halbe Lautstärke könnte für Nebenbei sogar etwas zu laut sein, sprich man kommt locker auf 15 Stunden im "normalen" Betrieb. Für Party usw wird er zwar laut genug sein, aber er klingt laut nicht mehr ganz so sauber, vor allem bei House-Musik usw. Am Strom kann er natürlich jederzeit betrieben werden, man hat so auch keinerlei Akkuprobleme. 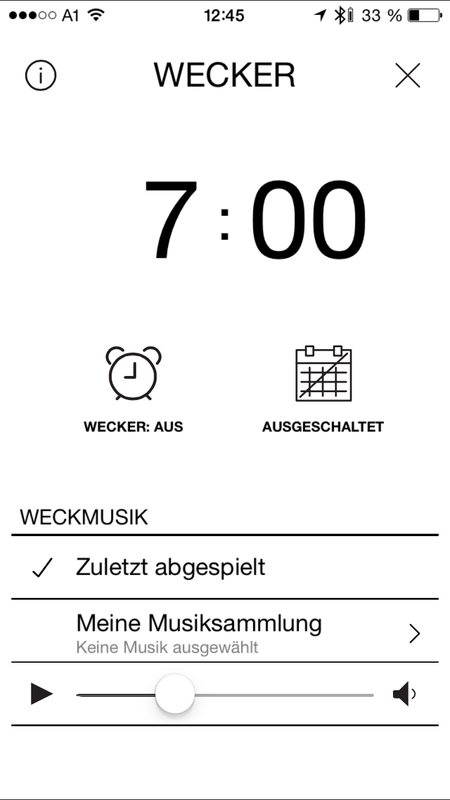 Pill XL ist so eine Sache, sie kann sehr laut und plärrt dann auch, Akku hält auch richtig lang, aber ingesamt finde ich den Klang nicht besonders angenehm. Aber, weil wir schon beim Thema sind: Wie wäre es denn mit einem portablen Marshall System? Der Marshall Kilburn ist ganz neu auf dem Markt, ich hab ihn selbst noch nicht gehört, kann wohl erst in ein paar Tagen was dazu sagen, aber er ist extrem vielversprechend. Ich kenne die anderen nicht portablen Lautsprecher von denen, und die klingen wirklich gut, der kleinste "Acton", der nur etwas größer ist als der Kilburn macht schon ordentlich was her. Ich denke mir, dass der Kilbrun trotz weniger Leistung auch richtig fett klingen wird. Akkulaufzeit wird bei halber Lautstärke mit 20 Stunden angegeben, ich kann mir vorstellen, dass er selbst auf Maximal noch gute 5-6 Stunden hält. 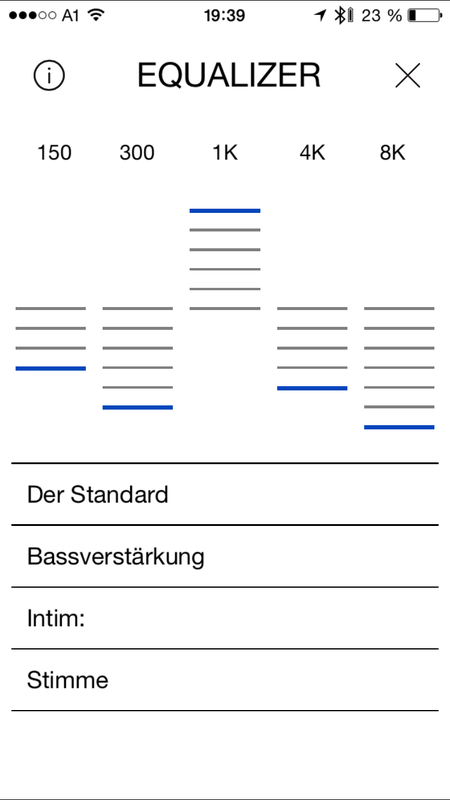 Neben dem Retrodesign ist halt das tolle, dass man dank der Bass/Treble-Regler den Klang noch ziemlich beeinflussen kann, draussen wird man wohl etwas Bässe dazudrehen, drinnen vielleicht rausdrehen. Mir ist auch aufgefallen, dass deren Lautsrpecher immer sehr beherrscht bleiben, selbst auf Maximal keinerlei Verzerrung oder Unsauberkeiten, sie reduzieren auch die Bässe nicht so stark wie zb der A2, ich kann mir denken, dass das beim Kilburn ähnlich sein wird. Der Kilburn ist natürlich auch schön. Qualitativ ähnlich gut wie der A2? Weißt du denn wann er auf den Markt kommt. Weil am 20.06. ist schon der Geburtstag. Ich glaube eher der Kilburn putzt den A2 weg.. ist ja auch deutlich größer. Der A2 wäre dafür eher geeignet öfters mitgenommen zu werden, der ist so schön flach, den kann man sich gut unter den Arm klemmen. Erhältlich ist er bereits direkt über die Marshall-Seite. Mein Freund hat sich schon einen bestellt, die werden dann von Schweden aus verschickt, ich glaube mit 2-3 Tagen Lieferzeit. Ah wie ich geschaut hab stand dort sold out. Jetzt ist er wieder erhältlich. Sehr cool. Ich glaub ich werde den gleich bestellen. Hoffentlich passt der Sound dann auch. Aber ich denke da werde ich damit nicht viel falsch machen. Oluv, thanks for all your reviews, they're great. I was hoping the Megaboom would be good because I want a good pair of Bluetooth speakers for stereo. What would you say are the best bluetooth speakers for stereo pairing? Have you tried the Braven 805 or 850? Thanks in advance. erstmal ..vielen Dank für Deine Test-Videos. Die vermitteln oft einen viel besseren Eindruck als das "Vergleichshören" in irgendeinem Laden. Auch haben wir mit Jazz, smooth Jazz und Funk einen sehr ähnlichen Geschmack, was das Probehören sehr angenehm macht. Aber, um auf den Punkt zu kommen: Natürlich sind bluetooth-speaker dazu gedacht, auch über bluetooth betrieben zu werden. Dennoch gibt es sicher viele Anwender, die diese Lautsprecher vom mp3-player über line in betreiben. Ich z.B nutze den line out meines FIIO X3II um einen portable speaker zu betreiben. Dabei ist mir aufgefallen, daß einige Modelle deutlich bessser über line in als über BT klingen. Vielleicht sollt man diesem Umstand auch etwas Rechnung tragen.